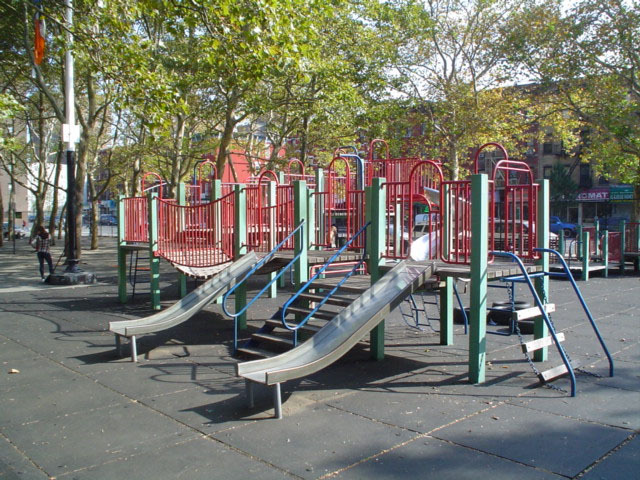 This park is named to honor Blake Hobbs (1911–1973), better known to local residents as “The Music Man of East Harlem.” A beloved musician, teacher, and volunteer, Hobbs dedicated his life to fostering the artistic growth of this neighborhood. Born in Scranton, Pennsylvania, Hobbs graduated from John Hopkins University in 1933 with a degree in math. Back in Pennsylvania, Hobbs started a small answering service company, but after a divorce gave up the business and moved to East Harlem in 1958. Soon after his arrival in northern Manhattan, Hobbs began working with the Union Settlement Association, a neighborhood housing, health, and advocacy organization, and ran the association’s music school. Despite a dearth of funds, Hobbs found ways to bring music to neighborhood residents. He worked from early morning, when he ran an “early bird” trumpet class, to mid-day, when he offered piano classes for mothers, to the afternoon, when he taught children’s classes, through the evening, when he conducted a young people’s orchestra. Under Hobbs’ leadership, the Union Settlement Association’s music school flourished. It eventually became a multifaceted cultural center that offered exhibition and storage space for artists and a forum for neighborhood discussions, as well as music instruction. In 1970, Hobbs suffered a stroke that left him partially paralyzed. He continued his work for the neighborhood, giving music lessons and serving the community until his death on May 5, 1973. This property, running from East 102nd to East 104th Streets on Second Avenue, was condemned in 1951 and leased at no charge to the city in 1958 as part of an agreement with the New York City Housing Authority to provide park space for the George Washington Houses. The housing project, part of a wave of public housing projects constructed in the 1950s and 1960s to serve East Harlem’s burgeoning population, was designed primarily to provide affordable housing for senior citizens. In 1976, a few years after Hobbs’ death, a local law named this park in his honor.